The holiday season is one of the most ideal times of the year for companies to build their brand. For many industries, the time period between Thanksgiving and the end of the year is prime selling season because people are in the holiday spirit, a celebratory mood that prompts them to buy. Companies should capitalize on this sentiment by raising their brand awareness in a meaningful and memorable way. This will enable you to cut through the holiday noise and keep your brand top of mind. This is one of the few times throughout the year when companies can be ultra imaginative with their holiday branding, which should be an extension of your general branding, by using festive colors and clever concepts. Throughout the creative process, be sure to stay authentic to your existing brand that’s been established. My company, Creative Marketing Alliance (CMA), has been generating a uniquely branded holiday card for more than 25 years. Fun photos of the firm’s employees are strategically placed throughout the design. The combination of creativity and people reinforces CMA’s branding, services and corporate culture. 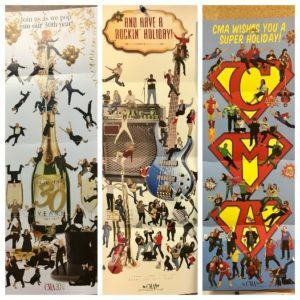 There’s a different theme each year, which has included a champagne pop to celebrate our 30th anniversary, superheroes, rock n’ roll and the CMA Crew’s favorite holiday ornaments. While we anticipate getting heartfelt holiday cards from friends and family, we don’t expect them from businesses. Sending those types of cards has been an excellent tool for CMA to build and maintain strong business relationships. In addition to being more outside of the box with your branding during the holidays, think about ways your company can be known for something that your customers will look forward to year after year. You want to choose something that not only showcases your expertise in your industry, but is unique, differentiates you from competitors and showcases shared values with your customers. According to the Harvard Business Review, marketers should build brand loyalty on shared values with its consumers. This will make your company more relatable, position you as an industry leader and make your company known for whatever it is your branding is trying to convey. Lexus has their annual “December to Remember” sale each year. The company began “December To Remember” and the red bow tied around a vehicle in the driveway in 1999. During the last two decades, Lexus’s leadership in highlighting holiday-season sales has led to a transformation of the period—and particularly December—from a relatively sleepy time for U.S. auto sales into one of the most interesting and creative, according to Forbes. Likewise, in December, CMA has become known for its holiday card. Our clients, prospects and friends look forward to seeing it each year, which has resulted in an increasingly higher response rate. Once you’ve established holiday branding that checks all of the boxes, share it through multiple channels. Print, digital and social are all good outlets to consider. In addition to mailing the CMA holiday card, we also produce a digital version that we share through an e-blast and throughout all of our social media channels, so people can interact and engage. It’s essential to keep the digital execution of the card interesting and dynamic, such as producing a platform where people can be a part of the conversation. The branding also needs to be consistent across all channels, so it will continue to resonate with your customers. The average revenue increase attributed to presenting the brand consistently is 23 percent, cited by Lucidpress. Would you like to learn more about how you can elevate your presence in your market and enjoy success? Let’s begin that process today. Have a happy and healthy holiday season! Jeffrey Barnhart is founder and CEO of CMA, a full-service, award-winning strategic marketing and association management firm that builds reputation, relationships and return on investment. He can be reached at jbarnhart@cmasolutions.com. Is it that time of the year already? When the days start to get shorter, companies begin to ponder what they’ve accomplished during the past year, in addition to thinking about the challenges ahead. One critical component to every company’s success is the “future plan.” Setting corporate goals and communicating them throughout the organization ensures that everyone on the team is heading in the right direction. If employees don’t know which way they’re meant to be going, they won’t get there. An article in Inc. cites alarming results from the 4th Annual Staples National Small Business Survey. More than 80 percent of the 300 small business owners surveyed said that they don’t keep track of their business goals, and 77 percent have yet to achieve their vision for their company. According to an article in Forbes—which refers to a Harvard Business Review article, “When CEOs Talk Strategy, Is Anyone Listening?”—only a fraction of our workforce is really clued in. The article cites research, which says that even in high-performing companies with “clearly articulated public strategies,” only 29 percent of their employees can correctly identify their company’s strategy out of six choices. That means 70 percent (seven out of 10) of all employees are unknowingly misaligned with your company’s strategic direction. To find the perfect balance, leaders may have to try several different iterations until they reach the ultimate “everyone is walking the same talk.” The benefits are endless. Having a common vision creates energy that naturally invigorates the company culture. You can measure success, identify, discuss and solve challenges, as well as make adjustments along the way. Marketecture™ is a unique process that identifies market positioning, creates the compelling sales messages and, ultimately, a strategy for creative communications tactics that propels the client’s brand power. It also ensures that you have the game plan to reach the correct audience, with the right messaging, to yield outstanding results. Many of CMA’s clients have had success utilizing Marketecture™, since the firm launched it 15 years ago, including a 100-year-old manufacturer that was losing sales because of a tarnished brand in the marketplace. CMA conducted a Marketecture™ session, coupled with primary and secondary research, and developed a well-rounded plan of action. The company, now 108 years old, has catapulted into a national industry leader. Another client, a global lighting manufacturer, wanted to differentiate itself in a growing target audience. Through our Marketecture™ process, we developed a customized customer incentive program to reward the new target audience for buying this company’s product, rather than another company’s product. In closing, because of the ever-evolving technological changes throughout society, strategic analysis will be an increasingly critical tool to identify what works and what doesn’t. Although the tools available to conduct strategic analyses are at our fingertips, CMA’s process takes those theories to a superior level. If you expect results, call CMA now to schedule your Marketecture™ session with our experts. Jeffrey Barnhart is founder and CEO of Creative Marketing Alliance (CMA) a full-service, award-winning strategic marketing and integrated communications firm that builds reputation, relationships and return on investment. He can be reached at jbarnhart@cmasolutions.com. An old adage says that the customer is always right. In the business book of commandments, you might find right next to that: Always put the customer first. These are business rules you can find countless articles about and engrained in our everyday culture. Putting the customer first, in simple terms, means that a business puts the needs and requirements of a customer ahead of anything and everything else. I’d like to challenge this idea. When you put your customer first, you are creating a culture that is chained to the whim of an outsider, letting your customers and potential customers be the driver of your company’s success. While customers are very important, one thing should go before them. Your employees and your talent. That should be first in line of your concerns, well before your customers. While numerous surveys, market analysis and research is done to make sure your customers are receiving top notch service with excellent products, little is often done to make sure your employees have resources for professional growth and are supported in a collaborative environment to provide solutions for clients. And, essentially, your employees make up your organization. It’s the employees who bring their efforts, enthusiasm and talent that make your company shine. When you have a solid company with satisfied employees giving their full effort, pleased and loyal customers naturally fall in to place. Over 20 years ago, business professors at Harvard University conducted a study comparing the most profitable service-based companies. The outcome showed that a 5 percent increase in customer loyalty boosted business sales. They researched dozens of companies and tracked this concept and came up with the service-profit chain. This means that profit and growth are driven by customer loyalty. Loyalty is influenced by customer satisfaction. Customer satisfaction is stimulated by a high perception of value of the service. Service is the result of productive employees. Productivity stems from employee satisfaction. When you hire talented, passionate, dedicated, genuinely kind people, you are putting yourself in a position to succeed. Creating a dynamic internal company culture creates a trickle down affect that leads to happier customers. Each member of your staff that interacts with your customer is capable of strengthening value or diminishing it. As a business owner, we strive to create invaluable employees that create dynamic value for our customers. When you focus on your people, your people focus on your customer much more. Empower your employees. Train them. Teach them. Provide opportunities for them. Just because your customers aren’t first, they still are very important to company success. You need to listen to customer feedback to create a better run machine. In today’s world of instant, constant communication and wide-reaching social networks, every company’s reputation is in the hands of the consumers that engage with that company. While a happy customer may or may not decide to log on to their computer or pick up their smartphone and write a rave review, an unhappy customer is more likely to do so, sometimes creating a digital war against a brand they are unsatisfied with. While you certainly need to listen to these complaints, you need to take them, absorb them and if it is a common thread that seems to keep arising, take note. Especially in today’s world, companies need to continuously change and adapt to their customer’s ever-changing needs and wants. If not, a competitor will. At CMA, we like to focus on keeping our employees empowered by offering company policies and activities that you might not find in every agency. We keep our employees happy with perks like company BBQs, offering the ability to bring pets to work, summer hours, a relaxed dress code, a laid-out path for success and job trainings are a few examples of the things our employees like about working here. When employees are happy, they are working hard and delivering excellent results for our clients. Then our clients are happy because they are receiving great work and achieving goals they’ve set out for their company. Create a list of how you make your employees feel taken care of. Identify what they are looking for out of a job, whether by talking directly to them or creating a suggestion box. Tweak your company culture and offerings where you see fit. Then watch as your employees feel ready to shine, making a better company for you, them and your customers. Should You Fire Your Client? Everyone wants as many clients as possible. Serving each client to the best of our ability in a timely manner is our top priority at all times. But not all clients are created equal. Some have a higher return on investment because they require less work, and some require more attention and maintenance than originally anticipated. Does the client share my Core Values? 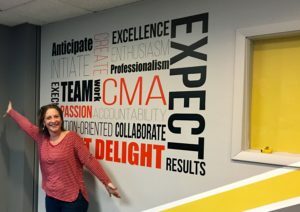 Every employee at CMA is expected to work according to a set of core values, and we expect some of the same things from our clients, such as teamwork and professionalism. These values are the foundation of a great working relationship and let everyone know what is expected of them. If everyone is not on the same page in terms of the basics of working together, the uncertainty can manifest itself into poor performance, confusion and a difficult relationship. At CMA, our Core Values are on display for everyone to see. Are they allowing me to do the job I was hired to do? After core values, this is the first thing I assess. They hired us to do a job for them. Is the client listening to our recommendations and expertise? Do they question every move? Questions and revision requests from clients are normal, but when excessive it could signal they don’t have a firm direction set in their mind or they are doubting themselves. How does the client treat my staff? Reviewing how the client treats your staff members is important because it answers whether the client is easy to work with or are they constantly asking their account executive to jump through hoops? While it’s okay to ask for an occasional jump (we all understand there are unexpected, urgent matters that can arise) it should be outside the normal course of business, not an all-the-time occurrence. This not only taxes your employees, but it gives the client the perception that this is an acceptable course of action and it can also delay other client work. I think about how long it took to negotiate the contract. There is a big difference between a tough negotiation and a difficult client. For me, the sales process is a big indicator of how the contract will be executed. From the time they expressed interest in our services to the time we can count them in the “win” column, what did the process look like? Was the client easy to reach? Were they responsive? Was there a rapport or chemistry? A long, drawn out negotiation process with lots of bumps in the road rarely makes a good roadmap for the rest of our time together. After a trying negotiation, some clients have proved me wrong, but a few have taxed our resources. I review the agreed upon scope of service. When account executives have to spend excessive amounts of time with one client, that client is less profitable. Think about it—imagine you have two identical contracts for $50,000. If one takes 100 hours to execute and the other takes 500 hours to execute, which one is making you more money? A sale is not worth anything if the profit margin is being eaten up by a taxing client. When thinking about your clients, examine why one contract is taking 100 hours and the other is taking 500. Is the account executive not connecting with the client? Are they not communicating well? Or is the client unsure of exactly what they want? We have all had the client who gets buyer’s remorse and wants to go back and change the scope of services after the contract has been executed. Depending upon the circumstance, this should be a red flag that the fit might not be right. If there is an out, it might be time to take it. I don’t even give them the chance to be fired. There are times, after an arduous negotiation process, we have walked away from a potential client because we felt they would not be a good fit for our company. While a large contract is very tempting, its potential drain on resources is not, especially if it does not match up to your core values. I cut ties when the checks stop coming in. When working with someone under contract, it’s very tempting to let them slide on a few invoices, but this is detrimental to your bottom line. You have employees doing work and they need to be paid. If a client isn’t paying you for that employee’s time, who is going to pay that employee on Friday? You. Making the decision to cut ties with a client is never an easy one, but sometimes it’s necessary to keep your business moving forward. A careful review and discussion with your staff will allow you to make the best possible decision. How much should a company value its employees? Well, they need more than a paycheck, they need to feel valued, empowered and part of the organization’s mission. And you, as a business owner, will reap the benefits of having an engaged and satisfied workforce. You won’t just feel good inside; you will drive business growth and profit. Employees relax for a while in the afternoon at one of CMA’s summer lunchtime BBQs. Your employees can be your best brand ambassadors. The more valued and empowered they feel, the harder they will work for your clients. The more productive they are, the more your clients will perceive the value of your service or product. Satisfied clients are loyal clients. And every business strives to create and maintain loyal clients. The key is to find the right team of employees for each client and then work to empower your employees to create client value and loyalty. Simple, right? Well, it’s easier said than done. After all, what do employees need to feel happy in their jobs? At CMA, we have several initiatives aimed at making work a fun, happy— and empowered— place to be. My leadership team and I came up with values that we would like every employee to emulate. These are the expectations we set and we believe it helps to have everyone strive for the same goals. Passion: We demonstrate unmatched client loyalty because we’re passionate about our clients and the services we provide. Enthusiasm: We radiate positive energy and invigorate those around us. Excellence: We anticipate, initiate and execute with a sense of urgency. Professionalism: We are competent, skilled and respectful in all that we say, do and represent. Solution-Oriented: We drive “out-of-the-box” solutions for clients and colleagues. Accountability: We take responsibility for all that we say and do. Teamwork: We harness the power of teamwork. We supersedes me. Our game plan outlines our strategic imperatives for the year, listing action items and assigning responsibilities within its pages to show employees how they fit into the company’s overall goals. It’s a motivational tool and helps employees feel like they’re part of the team, with assigned goals and objectives. When employees do not understand their role in the company, they can become discouraged, leading to decreased productivity and company turnover. The game plan is also a way to measure our yearly initiatives and analyze return on investment. We believe that happiness begins with being a pet-friendly office. Dogs are a regular part of our culture here at CMA. We have been a pet-friendly workplace since I founded the firm in 1987. It has helped define our culture. We work long and hard for our clients. Pets help us keep our sense of humor, spark creativity and maintain a healthy work-life balance. We have a committee of employees that regularly plan fun outings for the entire staff. Sometimes it’s an egg hunt for Easter, once in a while it’s a happy hour after work, and other times it’s as simple as community volunteer opportunities. These are moments when all employees can get away from desks, paperwork and phone calls. 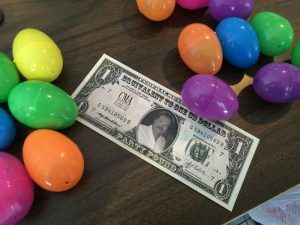 “Jeff Bucks,” which can be exchanged for a snack or soda in the kitchen, are more popular egg hunt finds than candy! We know employee productivity and motivation can lower as temperatures begin to rise. During May, June, July and August, we offer ‘summer hours,’ adding an extra 30 minutes to each workday Monday-Thursday and then letting employees leave at 3 p.m. on Fridays. We also have biweekly outdoor company picnics. 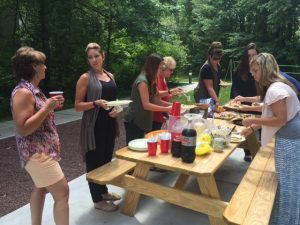 Everyone pitches in, potluck-style by bringing appetizers, side dishes and desserts, while the company provides the hotdogs, hamburgers and grill. For an hour, we simply enjoy each other’s company, without talk of deadlines, clients or reports. Our biweekly company picnics have proven to also be opportunities for team-building and increasing staff relations. We believe in treating people the way you want to be treated yourself. Encourage your employees to learn and take on new challenges as they grow within the organization. Embrace a management style that treats people professionally and gives them the flexibility and freedom to create their own path within their work environment. You know the saying, “it’s not personal, it’s business.” I believe all business is personal and the more you value your employees, the more rewards your company will reap. Jeffrey Barnhart is president and CEO of Creative Marketing Alliance (CMA) a full-service, award-winning strategic marketing and association management firm that builds reputation, relationships and return on investment. He can be reached at jbarnhart@cmasolutions.com. My company, Creative Marketing Alliance (CMA), celebrates its 30th anniversary this year. The odds of startup businesses making it to 30 years is less than 1 percent, so I’m thrilled to have created something out of nothing and have it still be in existence. That being said, businesses fail all the time. I know that I’m one of the lucky ones. However, I also made some important decisions along the way that put us on the right path. Being an entrepreneur is no easy task. Here are some of the key elements that I think have helped us succeed and grow along the way. Find your niche. While working as a marketing executive at Philips Lighting, I found that a lot of agencies didn’t take the time to understand my business in order to provide the right strategy and tactics I needed. They just wanted to sell me services that didn’t apply to my business. In 1987, I founded CMA, a full-service, award-winning strategic marketing and integrated communications firm in Central New Jersey. Soon after, we added an associated management division. Be strategic. If your organization lacks a strategy, you won’t know where the company is headed. Without a goal and a compass to guide you, you could be going full steam ahead in the wrong direction. I’ve always set company goals and then paired them with a strategy for how to achieve them. One of the initiatives I implemented was the introduction of an association management business unit. What I found is that marketing and association management are at opposite ends of the business cycle. When one business ebbs, the other one flows. Work in your clients’ best interests. People do business with people they like and trust. That’s why my business philosophy is to be a strategic partner with my clients. Coming from the client side, I designed CMA to be an extension of a company’s in-house marketing department. We offer services from public relations to social media to design to digital— all supported by strategic marketing—in one place. We are in it for the long haul and prefer to have long-term relationships with our clients. Define and embrace your company’s core values. My management team and I gave a lot of thought when it came to outlining CMA’s core values. First we identified employees who exemplify traits we admire and then came up with the seven core values we live by today— passion, enthusiasm, excellence, professionalism, solution-oriented, accountability and teamwork. Build an outstanding team. Treat people the way you want to be treated yourself. Encourage your employees to learn and take on new challenges as they grow within the organization. Embrace a management style that treats people professionally and gives them the flexibility and freedom to create their own path within our environment. Don’t have a backup plan. I started CMA after the 1980 stock market crash had led to a global recession. People told me it was pretty stupid to start the business in the middle of the recession. When you have no other recourse but to move forward, you move forward. Failure isn’t an option, so push ahead and succeed. Be financially prudent. CMA has never been in debt. Companies that haven’t survived recessions often have a lot of debt and have had to downsize or close their doors. We have always been prudent in not spending what we don’t have. We continuously market ourselves and have a very steady business development effort, even during downturns. As the business grows, loosen the reins. In 2015, CMA welcomed Chief Operating Officer Christian Amato. He is helping to shape our overall business vision, analyze expansion opportunities and deliver growth.The agency needed a strong operating executive to lead day-to-day operations, which allows me to focus on the vision of where we are going and the strategy to get there. Embrace change. Customers typically prequalify their purchasing decisions online as part of their buying decisions. Marketing has become about driving people to your website and letting them go through that part of the buying decision themselves. When I started my organization, people had bigger budgets, fewer mediums and fewer groups in the workforce so you could focus on fewer things. Now you have more generations that want to receive their messages differently and more mediums. It’s the end of the calendar year, a time to look back and see where your company has been and where it is headed in the future. Well, sort of. I suggest that business executives plan for the next year before conducting a post-mortem on the current year. I say that because it’s important to keep the momentum of your business going forward, rather than get mired down in the details of what may not have panned out as you expected. Create a company game plan. My department managers create a budget and a year-long strategic plan before the new year begins. The plan includes the strategic imperatives for each department, along with the name of the person responsible for each project. Each person responsible will then create a detailed outline of tasks, available resources and deadlines. Once everything is compiled, we put it into a binder for each employee and call it our CMA Game Plan. This way, our vision for the company is in black and white and there’s transparency at all levels of the organization as to where we plan to go next year. Raise the bar. If you achieved your plans this year, then you will just repeat that game plan for next year, right? No. You have probably heard this before, but it is important to improve each and every year. Do not allow yourself to get complacent, that’s how companies fail. Set goals that you think you can achieve, but make them stretch goals. Always look to improve. Encourage employees to up their game and improve their skills. Always assume your team will remain the same over the next year, even though there will undoubtedly be turnover. If and when employees do leave, replace them with employees with more experience to minimize downtime and keep on track to achieve company goals. Motivate employees. The company game plan lists employee names and assigns responsibilities within its pages and so it shows employees how they fit into the company’s goals. They feel like part of the team, with goals and objectives. The company game plan is a motivational tool. I find that employees who do not understand their role in the company can become discouraged and that can lead to company turnover. When employees do not see their names within the pages of the game plan, it often inspires productive discussions about where it makes sense for them to support the company’s strategic imperatives. Determine company profit and reinvestment. There is always a fine line between what company owners want to earn and how much of the profit will be reinvested into the company. Money can be reinvested in the business’ building and grounds, employee raises, offsetting a portion of healthcare premiums, technology upgrades or a myriad of other things. It’s a delicate balance to determine the costs and benefits of each potential project. For example, will the $2,000 new laptop upgrade produce a workload efficiency equal or greater to the cost? Review the past 12 months. If your company followed a proper budget process, there really should not be any surprises in the numbers. Your department heads not only should have compiled a numerical budget, but also a written narrative outlining the department’s roadmap, assumptions about revenue and expenses and plans to achieve those goals. No budget will hold for a full year, that’s why businesses should use a rolling budget forecast to show your assumptions, but then adjust the forecast as reality changes those numbers. The great thing about running a small company is that your organization can be flexible. Should circumstances change within the economy or within your industry, smaller organizations have the ability to pivot strategies and execute more easily than a large corporation. Make it happen. I find when everyone has the opportunity to contribute and work together toward a common goal, it makes for better interaction and a better product. What do you think? Jeffrey Barnhart is founder and CEO of Creative Marketing Alliance, a full-service strategic marketing and integrated communications firm that delivers award-winning campaigns, recommendations and return-on-investment (ROI). He can be reached at jbarnhart@cmasolutions.com. Every business is part of a community—a community of employees, a community of clients and a community within your town, county and state. The question is, how does your business contribute to its greater community? Or is community involvement even necessary? I would argue that not only is community involvement important, it’s critical to your organization’s success. Community involvement not only strengthens the giving-back culture we have here at CMA, it also sets our organization apart. We lead by example. Our company has a solid foundation in this community and we help others succeed through a variety of efforts. If you would like to begin your own community involvement, first outline what you hope to achieve. What causes are important to you and what image does your organization want to portray? Would you like to be known for volunteerism, leadership or strategy? Set a goal and construct a tactical plan for achieving it. Plan the results you would like to achieve, and you will likely achieve more than expected. CMA crew members collecting supplies for a fundraiser. Partner for a good cause. Be aware of local events, charities and fundraisers. Support causes within the community that employees and customers are passionate about and make a difference. • Last year we partnered with the Trenton Area Soup Kitchen’s “Adopt a Family” holiday program. A mother and her five children provided their wish lists anonymously and CMA employees who wanted to participate bought items or gift cards for the family. Then we presented the bounty back to the soup kitchen so that the local family could enjoy holidays that might not otherwise have been as festive. 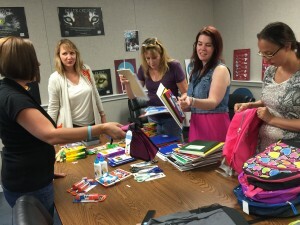 • We have collected school supplies for children in foster care through One Simple Wish’s backpack drive. We have also collected shoes for Soles4Souls, which donates shoes to people living in poverty. • On a larger scale, we are currently partnering with our client Susan G. Komen of Central and South Jersey, which works to raise money and fight breast cancer. The organization’s largest annual fundraiser, Race for the Cure, was more than $300,000 short of its goal last year. So this year we became a Silver Sponsor of the race and our employees have put together a team to fundraise and walk in the upcoming event. • Animal shelters are always looking for volunteers to socialize with the dogs and cats, so send a small team of employees once a month to hang out with the animals waiting for adoption. Not only is petting animals shown to reduce stress and lower blood pressure, it’s a way for employees to bond while providing a valuable service to a local organization. • Put a basket in the lobby and encourage employees and customers to donate non-perishable food items for a holiday food drive. • Piggyback on another organization’s initiative. We recently collected clothing donations at our office and then donated them to the Rescue Mission of Trenton, helping the Mission break the Guinness World Record for the largest collection of clothes for recycle/donation. The clothing went to the organization’s homeless clients or was sold at the thrift shop with profits going back to the Mission, which provides a safe, clean, warm refuge for the homeless, the hungry, the transient and the addicted. Offer internships to local college students. College students always need work experience and businesses can always use extra hands, especially students who are eager to take on new challenges. At CMA, we provide internships to a half dozen college students each fall semester, winter semester and summer break. We regularly have students working in marketing, public relations and social media, human resources, studio design, accounting and association management. We love providing students challenging work as they ponder which direction their careers may take. You never know, a standout student intern may someday become a full-time employee with your organization. Showcase your employees’ community involvement. Employees are often passionate about giving back in their personal lives and we encourage that passion. Here at CMA, we have employees who participate in a variety of causes and when appropriate, we share photos and news of their activities. It is important to show that sometimes the smallest acts can make a big impact. We encourage team members to not only be great employees, but great neighbors as well. Whenever we are out in the community, we snap photos to share on social media. Not only do we want to engage with our customers and fans on social media, we want to spread the word about the great nonprofit organizations out there that are making a difference in our communities. 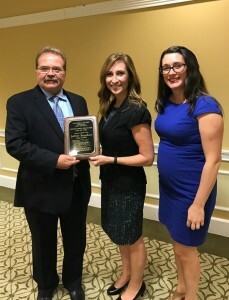 Jeffrey Barnhart, president and CEO of Creative Marketing Alliance, Tana Smith, principal, Hopewell Valley Central High School, and Erin Klebaur, director of marketing services at Creative Marketing Alliance, after he was introduced as a Distinguished Graduate on October 20. PRINCETON JUNCTION, N.J. – Oct. 21, 2016 – Jeffrey Barnhart, president and CEO of Creative Marketing Alliance (CMA), a full-service, award-winning strategic marketing communications firm, was inducted yesterday into the Hopewell Valley Distinguished Graduates Hall of Fame for his outstanding career and many accomplishments. 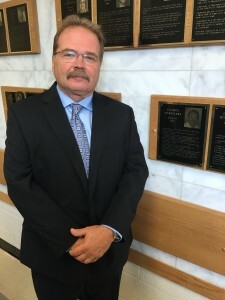 Barnhart, a member of the Class of 1973, joined 45 other esteemed graduates from Hopewell Valley Central High School into the Hall of Fame. Barnhart was recognized on Oct. 20 at Mountain View Country Club in Ewing. 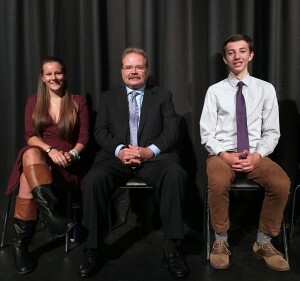 Jeffrey Barnhart, president and CEO of Creative Marketing Alliance, is pictured with two seniors from Hopewell Valley Central High School moments before he was introduced to the student body as a Distinguished Graduate on October 20. After graduating Hopewell Valley Central High School, Barnhart went to Rider University in Lawrenceville and graduated with a degree in journalism and a marketing minor. Throughout his more than 40-year career, Barnhart, now a West Windsor resident, has developed and implemented successful marketing campaigns to help numerous companies grow and achieve their strategic imperatives. Prior to founding CMA, his extensive background included the integration of sales and marketing through three mergers at Philips Lighting as the director of marketing communications. While at Philips, Barnhart led the launch of compact fluorescent lamps, one of the first energy-efficient, environmentally beneficial lighting products in the U.S. market. Shortly after founding CMA in 1987, he was instrumental in working with the Environmental Protection Agency (EPA) to develop and initiate the Green Lights program to encourage U.S. corporations to install energy-efficient lighting technologies. This was the first program that advocated using new lighting technologies to reduce electricity demand—the precursor to the current Energy Star program. One of CMA’s first clients was a credit card manufacturer that hired CMA to rebrand the company. Working with this card manufacturer led Barnhart to launch the International Card Manufacturers Association (ICMA) in 1989. He saw there was no association representing credit card manufacturers and personalizers that focused on manufacturing cards, the equipment and the raw material that make up the card. 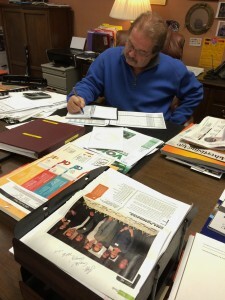 In addition to collecting more than 325 awards for the work CMA has produced throughout the years, Barnhart was named the first Entrepreneur of the Year by the Princeton Regional Chamber of Commerce in 1993 and CMA was named 2016 Outstanding Small Business of the Year by the MIDJersey Chamber of Commerce. For more information about Creative Marketing Alliance, visit GoToCMA.com. Creative Marketing Alliance (CMA) is a full-service, strategic marketing communications firm that delivers award-winning campaigns, recommendations and return-on-investment (ROI). CMA builds brands from a client-side, value-based perspective. It successfully launches and manages integrated marketing programs using Marketecture™, a strategic analysis process that helps clients understand how their company can be best positioned. Based in Princeton Junction, N.J., for more than 29 years, CMA provides innovative solutions in the areas of traditional design, interactive design, publications, public relations and social media with an in-house studio for advertising and creative design. For more information, please visit GoToCMA.com, call 609-297-2235 or email us at info@cmasolutions.com. Every fall, the word begins to crop up with increasing frequency in work conversations. Budgets. Budgeting. If you are like a lot of people, you may cringe at the mere mention. After all, this is a business, let’s get to the real work, not these endless sheets of paper crammed with numbers, right? Nope. If that’s what you think, I’m here to help. Want to know a secret? 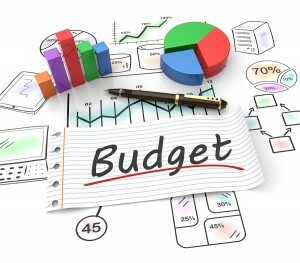 Budgets are living documents and will serve as the backbone of your business. The budget will show you where the company has been, where it is now and where it is headed. Without a budget, you might as well be adrift at sea. You will not be able to anticipate problems, correct a mistake mid-course or chart a course for business growth. Your budget is your business plan. It’s the blueprint to where your company has been over time and where it is going in the future. And yet people are still afraid of budgets. My theory is that people don’t fear budgets, they fear accountability. People are afraid of being measured and that is exactly what budgets do— they measure performance. When you create a budget, you estimate what is going to happen and as the budget year progresses you see what actually happens. People should not fear the budgeting process if they have a solid business strategy and methodology to support the numbers. A budget allows managers to make assumptions about their businesses and then validates those assumptions. October is the ideal time to begin your next year’s budgeting process. When I request budgets from my department heads here at CMA, I don’t just want an Excel spreadsheet filled with numbers. I also require a written narrative and that is typically more important than the numbers. I want to know where each department head sees his or her business unit headed during the next 12 months. What assumptions will they make about revenue and expenses? If they anticipate an increase in expenses, there should be a corresponding expectation of additional revenue and a plan of how they plan to achieve that goal. When a budget is complete, it will serve as a blueprint for your business activities during each of the next four quarters. And the budget creates accountability as everyone works to achieve the agreed upon goals. To be clear, budgets don’t always go according to plan. In fact, budgets are more art than science. Your company’s health insurance costs might be steeper than anticipated. An employee’s computer might unexpectedly need to be replaced. These things happen. Just remember that budgets are not meant to be created and then ignored for the next year. You should always have a rolling budget forecast showing where you think your budget is going based on certain assumptions. If reality changes those numbers — and it will — you should adjust your rolling budget forecast. I expect my department heads to follow, manage and adjust their budgets accordingly throughout the year. Sales and Revenue. Use last year’s actual sales as a base, but if this is your first year, research other businesses in the same field to get a sense of what numbers to use. Be cognizant of things that may affect sales— the economic forecast or the loss of a big customer. Costs and Expenses. There will be three categories of costs: fixed, variable and semi-variable. Fixed costs will stay the same regardless of your sales throughout the year. You will probably know your fixed costs in advance. They include items like rent, leases and insurance premiums. Variable costs will rise and fall depending on your sales volume and include items like raw materials, inventory and shipping. The final category, semi-variable costs, are those that may change as your business volumes rise and fall. Semi-variable costs include salaries, advertising and telecommunications. Profits. Anticipate a profit margin that is in line with other businesses in your industry. Once you calculate sales and expenses, you’ll need to see if that leaves you with a profit margin that is in line with your expectations. If you come up short, consider ways to increase sales or decrease expenses. Having an accurate estimate of profits will help you make long-range plans, be it hiring additional employees, buying new equipment or moving to a larger location. Once you have the data you need, go ahead and create both your budget and your written backup explaining your assumptions and plans for the next 12 months. Remember that your numbers are meant to support your business plan. For example, if you believe your department is understaffed, there should be revenue growth to support your claim. Most importantly, do not be afraid of budgets. Sure, they can be daunting at first and time-consuming, but creating a budget is essential. If you don’t know the hard data of where your business has been, it will be virtually impossible to map out a useful, strategic plan of where your business is headed. A budget will keep you on track and help you achieve your goals. Jeffrey Barnhart is founder and CEO of Creative Marketing Alliance, a full-service marketing communications firm that helps organizations build reputation, relationships and revenue. He can be reached at jbarnhart@cmasolutions.com.